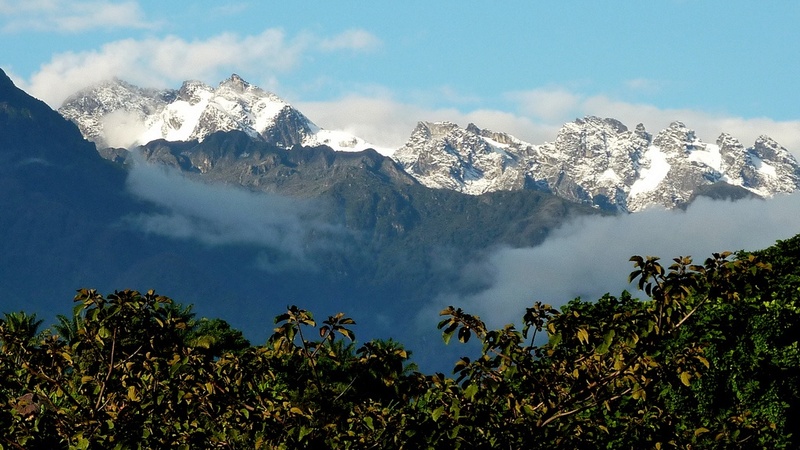 Uganda ‘s Rwenzori Mountains are also referred to as the legendary “Mountains of the Moon” for it’s mist and snow-capped peaks. The Rwenzori Mountains in western Uganda are perfect for world class hiking adventures in large evergreen & bamboo forests. The trails lead through rainforest rattling with monkeys and birds, then tall bamboo forest, before emerging on the high-altitude moorland zone,a landscape of bizarre giant lobelias, towered over by black rock and white snow The higher moorland zone is known for its surreal cover of giant heathers, lobelias and groundsels. This picturesque mountain park is a World Heritage site of UNESCO and was one of my very fond memories of Uganda. Looking back at this day when I accompanied my tour guide to Rwenzori Mountains, I am overwhelmed by the sheer beauty I experienced there. The multitude of waterfalls present all around, its numerous lakes and glaciers and the awe-inspiring plant life which this park can claim to its name is truly one of a kind. All these reasons are very much responsible for the boost in eco-tourism, directed towards Rwenzori Mountains National Park Uganda. Getting to Rwenzori mountains national park was pretty easy. It was my second destination in Uganda after Kampala, since the county’s capital serves as the park’s gateway. The park offered a number of entertainment adventures for its tourists. It offered camping, trekking and climbing; each conjugated with spectacular and picturesque views. My mountain climbing jaunt in Rwenzori Park is my most favorite memory of the place. I was supposed to stay overnight at Kasese town, at the mountain’s base, but the stay was totally worth it. The local cuisine flattered my appetite like nothing else. Most of the time I went alone for nature walks and along the way benefited from many cultural performances as well. When my guide was filling me in with the history and myths of this mountain range, I was particularly struck by its fabled name. I was informed that Rwenzoris are popularly called as the ‘mountains of the moon’. I was also informed that the park boasts many natural habitats for the world’s endangered species. It also has a very rich and flourishing flora. These facts combined with the untamed beauty of this region make this park one of Uganda’s, rather one of Africa’s most beautiful Alpine regions.